The efforts by many listed firms here to turn their fortunes after coming under fire from regulators show that a lengthy trading suspension is not necessarily a death sentence. More than half of the companies now under prolonged suspension are looking to resume trading or launch a reverse takeover (RTO). And while the suspension list has grown longer in recent years, the Singapore Exchange (SGX) told The Straits Times that it does not mean the quality of companies here is dropping. 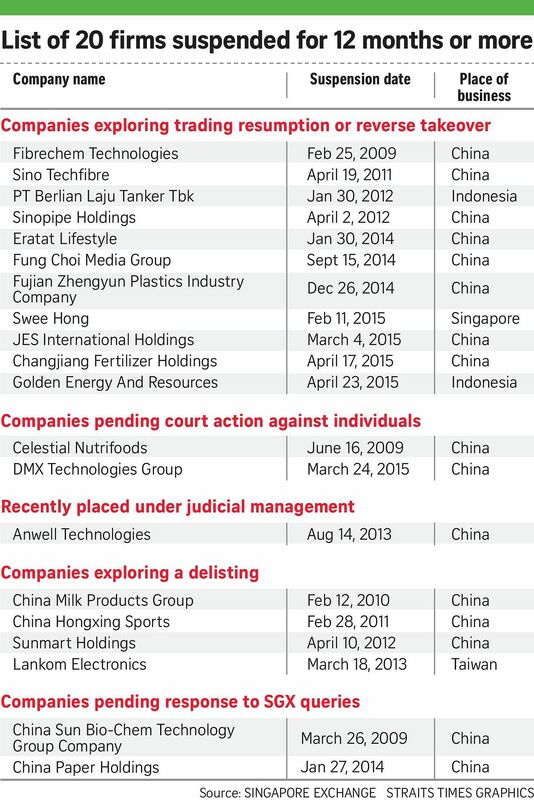 A recent SGX report noted that as at April 30, there were 20 firms that had been suspended for 12 months or more. The reasons are many and varied but they usually point to financial and governance issues that managers failed to fully clarify with the SGX, which in turned forced the regulator's hand. Seven of the 20 are exploring a resumption of trading while four are considering an RTO. In a typical RTO, a listed firm will acquire a private company's business by issuing new shares to the takeover target. Often an RTO implies a shift of business model to give the company a new lease of life - an ideal outcome for the affected shareholders, SGX listing compliance head June Sim said. "Suspension does not mean this is the end of a company. Many of the 20 companies on the list are going through restructuring and would need time to resume trading, or at least procure an RTO of new business, with a view to resume trading after its issues are resolved," she added. This will be good news for investors of the RTO seekers on the list, such as Fibrechem Technologies, Sino Techfibre and Changjiang Fertilizer Holdings. Others, such as Sinopipe Holdings, Fung Choi Media Group and Fujian Zhengyun Plastics Industry Company, have moved further, notifying the SGX in recent months that they are eyeing a resumption of trading. But shareholders should not expect a clean getaway even in the best-case scenarios, Gibson Dunn partner Robson Lee noted. "An RTO will result in a massive dilution of the shareholdings of all existing shareholders. It will offer shareholders the prospect of a new lease of life, but they will get a much smaller slice of the cake," he said. Some companies simply cannot solve their issues and will have to delist. Four of the 20 companies will likely do so, but there may be a reprieve for China Hongxing Sports and Sunmart Holdings as the duo could table an exit offer to buy out minority shareholders. These deals could get messy, RHB research head Ong Kian Lin said, adding: "It could be a case of deadlock such as the C.K. Tang situation previously." In its move to delist in 2009, the retailer angered some of its investors who thought the offer price was too low. Shareholders of the remaining five companies on the list of 20 may have no option except to wait and hope for the best. Among them, Celestial Nutrifoods was placed under liquidation in 2010 and is in the process of suing several ex-directors for breach of duties. Anwell Technologies, now under judicial management, is in turn being investigated by the Chinese government over alleged misuse of municipal money. China Paper has simply ignored SGX queries since its suspension in January 2014. While their issues drag on, the number of suspended firms is increasing. There were 12 stocks that had been suspended for 12 months or more as at April 30, 2014, but that had risen to 16 last year and 20 by the end of April this year. But Ms Sim said there is no cause for alarm: "Looking closer at the data, four companies were added to the list of long suspended companies between April 2014 and 2015. Two of these were suspended over financial problems, two for special audit. "Between April 2015 and last month, we saw two suspended firms resume trading, and one provided its exit offer. Seven new companies were added to the list, but two of them were suspended over technical issues - one of them was a cash company, another did not meet the public float requirement." So the number of new entries was consistently at around four to five, Ms Sim said, adding that there is no clear trend of whether companies were suspended due to commercial or non-commercial reasons.